Suitably attired, we wnt off to the restaurant. And what a restaurant! Loads of chandeliers, plenty of rich brocade… the whole was redolent of a glorious imperial past. As part of the ‘post Matisse’ calming down, the prospect of a good dinner was a fine distraction. Esmeralda WAS sulking, she needed the help of some very willing and good natured Russians to give her a push start. We eventually got our petrol but the notion of sauntering down to Moscow the following day was cause for anxiety. Anyway, suitably attired, (including my old friend, the linen suit) we went off to the restaurant. AND what a restaurant! Here was our ageing dowager incarnate. Loads of chandeliers, plenty of rich brocade, furniture not quite right, but pretty ornate as were the table settings. The whole was redolent of a glorious imperial past. As we sat down, we would not be surprised if Prince Bolkonsky and Natasha Rostova stepped out of the pages of War and Peace and wondered if they could join us for a couple of aperitifs. Our company was more mundane but agreeable enough and slightly bemused by their antipodean table sharers. A combination of fractured words and descriptive gestures sort of communicated. Somewhere between the main course and the sturdy Russian pudding the world changed. 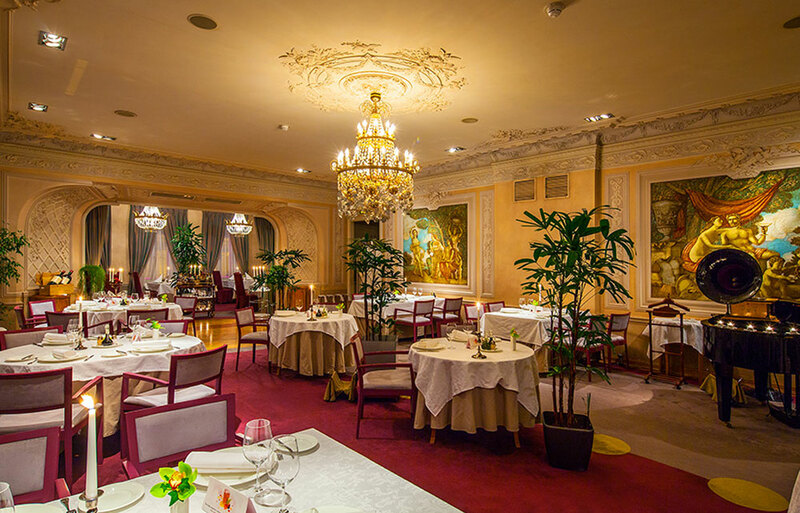 Sadly I don’t have my own photograph, but this shows the Palkin, one of the oldest restaurants in St Petersburg. Some ten years earlier, at the dreaded secondary school, we were lucky enough to have dancing lessons. One would keep this fact Sub Rosa, in that, if you bumped into a bunch of your well built rustic contemporaries, you would not announce how well your Scottish Country Dancing was coming along. Added to that, for some reason, I was quite stoked on the big band American music of the twenties and thirties. That fascination is no longer with me but it did crop up with our dancing teacher. One day she happened to be playing this stuff at full tilt and I said how much I loved it. ‘Why don’t we dance to this stuff?’ I asked. ‘People do,’ came the reply, ‘let me show you the Charleston.’ Five minutes later, I was hooked. Her comment was ‘whether you like it or not, you are a natural with this dance. Be a devil, you clearly love it’. I did and I was good. Amazing turn of events. Out of nowhere, a splendid big band roared into life. They had it all, classy trumpet, tenor and alto sax and clarinet soloists, a rhythm section that drove things along at a pace which would have given any American band a run for their money. I got on the dance floor and re- entered this magic world, oblivious of time or space. This was my own Russian Sputnik, a self-contained satellite that had its bum on fire and put on such a show. Poor Ronda was a bit upstaged by all this, the dining audience couldn’t get enough of it. Eat your hearts out, Fred and Ginger. I was in the grip of something else, transposed and transported. Talk about dancing all night…but after the third set, the band took a breather, and so did I. Magic, will live forever. My linen suit creaked at the seams but held together. Later, normal life abruptly returned with my new best Russian friends. This took the form of a little chat between a Ukrainian and Georgian, conducted along pugilistic lines. It seems one of our heavily henna’d darlings had been playing both ends against the middle and the boys would settle the matter as to who would prevail. The bouncers determined the resolution would be decided somewhere along the Nevsky Prospect. Next day, the drain of ballroom euphoria was accelerated by Esmeralda and her mega-sulk. No amount of cajoling or push starting or even the threat of Siberian exile had the slightest effect. Suddenly Moscow seemed a hell of a long way away. There would be more chance in Leningrad of finding a capitalist advice centre than there would be of coming across a VW garage. We needed the services of a highly skilled mechanic, or there was me. The vicar’s eyes raked over me as though I was some reject from a sad car boot sale. He then noted, somewhat frostily, that he did not recall seeing me, or my intended, in the congregation. Had we recently moved into the area.? Of course. However, I did sense a hint of uncertainty in all this. I guessed that he heard about these Croc. Dundee Oz types who owned Belgium -sized cattle ranches in Western Queensland. Such hints alluding to this might have crept into our conversation. In any event, he adopted a more conciliatory tone AND did he pick up a whiff of a cash crop not a million miles away? ‘Right’, he said briskly, ‘I think we can help here’. Before we got to dates and suchlike, he rattled through the assorted expenses involved in all of this. This included his fees,flowers, organist, ushers, documentation and a few other frills. A previous experience came to me mind as the cost of this caper spiralled into some kind of absurdity. I once approached a bookseller regarding the price of a Jane Austen first edition which would have been a lovely birthday present for my avid- reader wife to be. He mentioned a figure approaching the speed of light. My reaction was impressive.I managed ‘studied’, ‘reflective’, ‘will I or won’t I’, ‘Oh, why not?’,all in one bundle. This kept the lid on my side-splitting laughter which would have ripped a gaping hole in this bookish inner-sanctum. Back to the good vicar. Once again, as we tripped merrily across the £1,000 entry level tag, I played my well thumbed studied response card. Money was no object of course, but I would consult with little flower and get her response. She was not all that stoked on formal procedures, preferring rather the smaller scale ceremonies. Next day I put in a call to the Wandsworth Registry Office. They were very helpful. From a somewhat blurred memory I recall 3 options on offer. flowers and more basic service and Offer 3: No music, no flowers and a bog standard ‘blink or you will miss it’ service. That was about ten quid. Done. The big day dawned bright and clear. It was a Saturday so I was going to miss out on a double time work day. Not good. Worse, my friend and witness had been on the sauce the night before and was physically and mentally incapable of any kind of participation. So , Ronda, her friend and witness Jan and I set off to catch the bus. Ronda, by far the most agile of the 3 of us sprinted ahead and got on the bus as it pulled out. She indicated to the driver that she was getting married and would he wait? He indicated something unprintable, dropped the clutch and booted it. We all got there in time. The area around the office resembled Wembley on cup final day. I appraised the marshal of my best -man problem and with the practised hand of years of experience, a loud -hailer was produced and the call put out for a witness. An ill fitting suit emerged from the throng. This was Pete, a plasterers mate from Peckham who could ‘dodejob’. His presence was accompanied by an aromatic halo of Watney’s bitter and Capstan Full Strength. A nice guy. The service was indeed a model of brevity. About midway through this the full impact of these proceedings shot home, rather like slamming home the bolt on an old 303 rifle. This manifested itself in a facial tic which Ronda and Jan spotted at once. They giggled. This got a sharp rebuke from our leader. Silence. The deal was done. Ronda and Jan set off for a ‘nice cup of tea’. Sod that. I popped into the King’s Head and set about 5 fingers of single malt. I lost the first bit with a final big twitch, then calmed down. I wonder what happened to Pete. Gainful employment, as was so often the case in one’s early years, (and still is) becomes a sort of ‘needs must’ shopping. In this instance, ‘shopping’ being le mot juste, as I rejoiced in a period of parcel wrapping in a large department store. The contents of these items were upmarket trinkets for the landed gentry in the Home Counties. At one point I was approached to see if I could double as Father Christmas for the upcoming Yuletide. It seems I must have been the choice of somebody totally unfamiliar with the physique of F.C. My profile was the same as 2 metres of pump water and I had to run round under the shower to get wet. ‘Never mind’, said the line manager, ‘soft furnishings will soon put that right’. Ronda had started supply teaching in the Peckham /Camberwell area. This experience stood at a bit of an angle, to say the least, to her previous life which involved teaching in a 2 teacher country school in New Zealand. Domestic arrangements, including the bath/ culinary experience, proceeded in an orderly fashion, until, at one point, the establishment of a long term relationship cropped up. Marriage, in other words. Hmmmm. It fell to me to get this show on the road. What better place to start than the local church? BUT, before that, antipodean parents had to be told of this turn of events. Stair-rod rain, of almost painful ferocity , greeted me as I splashed my way to the welcoming sanctuary of the dimly lit telephone box in Putney High Street. My pockets bulged with change of varying denominations. The overseas call got underway and a chronological miscalculation immediately became apparent. Tasmanian time was around 3 a.m. Worse, the rain had re- doubled it’s efforts and, as I gazed out of the misted up window, I could see a queue had gathered around the phone box. OH GOD! Even worse, my father was pretty deaf and my mother had to relay all the info, or if I spoke to him, I had to scream down the line. This information was immediately picked up and transmitted down the ever lengthening queue. The conversation became a broadcast. A sort of grotesque game of Chinese whispers – or Chinese screams. The rain hurled down. The drenched women were really OK in a sort of sentimental way and gave us best wishes for the wedding. The lantern jawed, cloth- capped men who were frantically trying to call about future employment, rather less charitable. And worse, the pubs were about to shut. Life in swinging London was in non-swing mode, not helped by my sad ‘digs’ in downtown Putney. An upstairs room in fact. In real estate parlance it would be described as a ‘builders dream’ or, depending on your situation, a dreary dump. I can still see the only form of ventilation. It consisted of one of those 15cm acrylic fans that are let into windows. Wow. What with that , the Pompeii walls and threadbare carpet, this boudoir was not quite the ticket if I could get my hands on a bit of that mini skirted, wide-eyed womankind as seen on TV. Not only that, every move I/we made would be tracked on the owners domestic grapevine. No doubt of that. This would not do. Will fix. In the meantime a trip to Wales seemed in order. My companion was another Kiwi, male this time , and unemployed. Two of the images from this sojourn in the mining valleys still remain. Although there is, or was, plenty of mining on the West coast of Tasmania, (including the hazards associated with this industry), they did not approach the scale of Aberfan. It must have been in late October that, by chance, we saw the massed grave of 144 people, 116 of them children, who were crushed under this collapsed colliery spoil tip. The lowering skies were a backcloth for a scene of utter devastation. The second indelible memory of this trip occurred when we fetched up at a village pub to have a couple of beers. The natives, exclusively male, were friendly, and, of course, as soon as we opened our mouths, questions of nationality cropped up. Once the words ‘New Zealand’ were uttered, the translation was immediate. and a goodly group of the locals gathered and, all very silent, watched proceedings. THEN, a spokesman intoned, in a wonderful cantabile D Thomas sort of way exactly what happened at Cardiff Arms Park when there was a DISPUTED try in an earlier Welsh/ All Black game, which the All Blacks won. The pieces were expertly moved here and there around the park as the game progressed. The date? Wait for it…1905. Back to London. After a while, but not with unseemly haste, domestic arrangements took a turn for the better. It must have been that linen suit that did the trick. It seems that my other New Zealand friend, female this time, she of the table tennis fame, found heavy communal living not to her liking. Thus it was decided, (not discounting my iridescent wit and charm, nor her attractiveness) to put together an alternative arrangement. So, we agreed to implement a ‘cut the numbers’ living proposal. Our accommodation, near Wimbledon Common, was a first floor flat. Downstairs, our Welsh landlady lurked. Her countenance resembled a map of the Brecon Beacons. She was also armed with a 3 metre (or so it seemed) broom handle, which was whacked on the ceiling if she heard the slightest noise. But, the real architectural gem in this place was having the bath conveniently located in the kitchen. If one was wondering what was for the next meal, this could be ascertained by seeing what detritus in the shape of fruit or vegetable offcuts that were bobbing about in the bath. It also facilitated a very convenient way of catching up on the days events whilst keeping a close eye on any boiling water involved in meal preparation. Earning an income now moved centre stage….very quickly. Our penultimate stop was the very pleasant Dutch Caribbean island of Curacao. The visit was modestly interesting, mildly dignified by a good look at a huge oil refinery. Seen one you have seen them all. But lo!, said oil refinery is still in the news up to this very day if the splendid ‘Curacao Chronicle’ is to be believed. It seems that an American oil outfit has lifted the sanctions it placed on the refinery which has been operated by a Venezuelan state owned company. The Venezuelans have agreed to pay compensation to the tune of 2 billion dollars. One’s mind boggles at how much that would be in Venezuelan Bolivars, what with the current rate of inflation! If it was paid in cash, it could be conveyed in an oil tanker. Quite appropriate. After an eternity, Southampton vaguely emerged into view. Well, a thin, grey silhouette of it did. Low cloud, drizzle, murk. A green and pleasant land lurked somewhere behind the shower curtain. Next stop London, and of course, more precisely, Earls Court. This was a well established Australian ghetto. Gosh. I certainly missed that wide-eyed bus alright. AND…a ticket to this fun- loving hedonism in a ‘shiny epicentre of style’ needed loads of crinklies. My financial epicentre lacked both shine and style. Getting gainfully employed started on a rather low rung. Not to be confused with Dirk Bogarde, I did a spot of night portering. My movie was rather prosaic and very tiring. At 3 in the morning subservience did not sit well, never more so than with a battalion of South African guests. Those, of the aristo variety, were cavalier, previously servant supplied and arrogant to the point of loathing. Their baggage seemed to consist of huge bags of recently minted krugerrands which had to be lugged up 5 flights of stairs. They never tipped. Yet, moments of delight and great fun occasionally appeared. Again, very late one night, a couple of postbellum Americans lobbed in. I dubbed them Rhett and Scarlett. Rhett glowed with a Jack Daniels tan and desperately wanted some ice for his bourbon. I explained that we had grief in our chilling department and no could do. He pressed on and on. Meanwhile Scarlett emerged from the bathroom crowned by a clutch of hair rollers whose wiring would break German radio codes. Rhett banged on AGAIN. ‘Right’ I said to him, ‘let me give you a simple questionnaire.’ ‘OK,’ he replied. ‘OK’, I said, ‘stay loose and, like general McArthur, I shall return.’ Which I did, clutching a bucket of ice which I nicked from a neighbouring hotel. His gratitude was far more than a weeks wages, but beyond that a kind of friendship developed during their stay. As he was about to leave, with the oven -ready Scarlett, I presented him with a bottle of Haig’s Dimple. Quite right too. 100 shades of nothing much. Never mind the sun being over the yard arm (as I ordered the first rinse of the day) the sun was scarcely over the gunwales when Spiro produced one of several cold beers. Not to forget the wine. The consumption of alcohol as an antidote was not terribly clever. Where have I heard that before? As for the good reader contemplating a tasty bookstore bodice-ripping romance, disappointment awaits. The blanket of boredom was ubiquitous, even enveloping the morose Latin lovers. My new best friend (aka Ronda, she the Kiwi of table tennis fame) was also a pretty savvy poker player. These were unexpected skills from an infant teacher. It was 50 years, almost to the day, that I savoured the deep joy of victory in the table tennis endeavour. Meanwhile, other on-board friendships, not quite so predicated on an increasing friendly rivalry, also developed. The boredom cavalry, cleverly disguised as Tahiti, at last made an appearance. The island will forever be associated with Gauguin, the French painter. He is, or was, the very embodiment of the truism ‘Death is a great career move’. A concept that his part-time mate Vincent would have also understood. Of course, there was the unfortunate ‘lend an ear’ incident. Oh dear. I can still imagine Gauguin, in his youth, trying to sell tarpaulins in Copenhagen. He was not aided much in this endeavour by his inability to speak Danish or the Danes did not want to know about his wretched tarpaulins. Interminable. Suffice to say, one of his final paintings seemed to encapsulate our sailing predicament. The title is : ‘WHERE DO WE COME FROM? WHAT ARE WE? WHERE ARE WE GOING?’ Amen to that. Somebody less charitable than me has suggested that his work as a painter would have been just as good, if not better, had he stayed in Brittany. Shame on them. The stopover consisted of a few drinks with the locals in a sort of ethnic watering hole. The natives were friendly, but they had that sort of posing and world-weariness together with the unspoken assessment of ‘just another sad load of tourists’. Next stop Panamá, or more precisely, Colon, the city at the other end of the canal, so to speak. The canal (first considered as a possible goer in the 1500’s) was finally completed in 1916 by the Americans. I imagine some TV gardening guru, with his wheelbarrow and spade, chatting to his allotment audience. With a confident wave of the arm, he announced he was about to shift 150 million cubic metres of soil so as he could start planting next week. Colon was founded in 1850 as a rail head and faster route for those going to California in the gold rush days. In those days, writing copy for tourist brochures for Colon would have been a nightmare. How would you avoid words like ooze, booze, swamps, alligators, poisonous insects, floating corpses, pimps, prostitutes, hoodlums and dictionaries crammed with notes on tropical diseases. I can just see a gaggle of excited SAGA tourists lining up at the tourist info. office, itching to make a start. When we lobbed in, the first thing spotted was lots of pock- marked holes on the Spanish Mission walls. Was this some kind of indigenous insect nesting site? The natives were friendly, if not effusive. We certainly presented no problem, underscored by the fact that they were armed to the teeth. The insects were obviously made of lead. Back to the good ship Ellenis. Let’s go! Not l o n g n o w…. . . The lopsided passenger ratio on our luxury liner was accounted for by the high percentage of the sons of European emigre’s (mostly Greek and Italian) returning for a visit to their ancestral homelands. The gunwales were almost awash with these handsome lads, AND they oozed charisma to boot. Gloom. I had a couple of contingency plans up my sleeve, but I had not counted on being outflanked by this lot of Latin lovelies. For some inexplicable reason (and one never to be repeated) I had kitted myself up with a suit! Not any old suit but a nice little pale linen number. The ensemble was given added glamour by the addition of a matching tie and classy suede shoes. When would I get to play this card? If at all? Another such irresistible lure (or so I thought) was my genuine interest in the current vogue of existential philosophy. It wasn’t so much the goings on of Jean -Paul and Simone and their writings, but reading the novels of Albert Camus. Hmmmm… Perhaps a bit heavy for a chat -up line. Of course, this combination of couture/ culture could backfire. Perhaps I might be approached by a woman of a certain age, of academic appearance, and clutching the complete oeuvre of Immanuel Kant’s metaphysics. These books would choke a horse. She would be thrilled at the prospect of intellectual exploration and exchange of ideas that our relationship would provide for the next 30 days. I went to the library and got out a copy of ‘The Cruel Sea’.